I love seeing project guns like this, it really shows what people are capable of. It might be perfectly safe, but I would definitely fire it from a vise just in case. Figured it’d be a fun project, I made some changes, as I can use a mill, so the whole segmented bolt thing was unneeded. 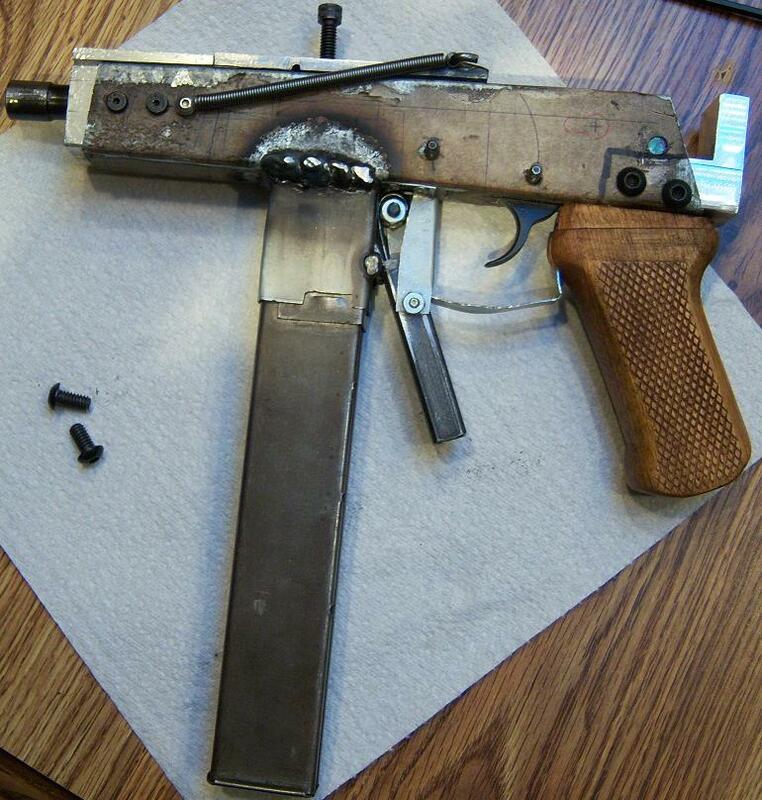 I got my dad to fold the receiver and weld on the mag well so I’d be all legal and such. It uses sten mags, has a modified AK fire control group, a luger barrel with a ring in it from a barrel wrench (I got it free at a gunshow), a fixed extractor, and a section of arc welding electrode as a firing pin. Bully for you! Your rear trunnion looks solid as hell – so it should be safe to fire. Also, I LOVE your recoil spring and how you have it mounted. The original design was vague-as-hell, and the rubber-band solution was OK, but yours is better. Good thinking and good problem solving. Next – your slide looks great. Could not have done a better job myself. You are to be congratulated – so many others will just talk or scoff – YOU took ACTION and you should be proud of your results. quick question but first looks really cool. now the question what about a paint job? blueing ?